Nikon's new "Advanced Compact, Interchangeable Lens" cameras will be available to buy in the UK from Thursday, and to celebrate, the Jessops store on the Strand is opening early and giving away prizes. The store will open at 8am, with the first 20 people to buy a Nikon 1 and standard kit lens receiving a £200 voucher to spend in Jessops, a £100 voucher to spend on Nikon's in-house training scheme and a Sandisk 8 GB extreme HD SDHC memory card. One person in the queue will also be picked at random to win back the full value of a Nikon 1 kit, worth up to £1500. Suzi Perry from Channel 5's The Gadget Show will also be present at the event, along with Nikon product experts who will be talking about the technology in the camera. 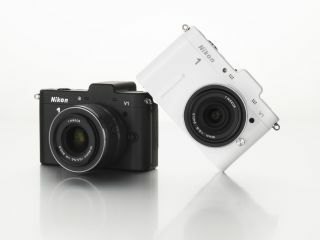 The Nikon 1 system, which comprises of the Nikon J1 and Nikon V1 was announced on September 21st. The first compact system cameras from Nikon, the cameras also use a new 1 mount, though Nikkor F-mount lenses are compatible via a special adapter. Four new Nikkor lenses are also available for the Nikon 1 system, a 10mm pancake lens, a 10-30mm kit lens, a 30-110mm telephoto lens and a 10-100mm lens which is designed especially for video. Using a smaller sensor than other compact system cameras on the market, Nikon claims that the 1 system are the fastest cameras in the world, with features including Smart Photo Selector and Motion Snapshot.